Japanese website Nikkei is continuing the 2016 doom and gloom sentiment surrounding iPhone sales, reporting that an unnamed source has confirmed that sales figures and shipment numbers for Apple's smartphone lineup will see the first year-over-year decline since the iPhone debuted in 2007. The website cites "lukewarm demand for a new model" and a lack of innovation as the major reasons behind the predicted sales decline. Specifically, iPhone shipments in 2016 are estimated to total between 210 and 220 million units, which would be a drop off of as much as 8.6 percent from 2015. The "people familiar with the matter" within Hon Hai Precision Industries noted that one of the company's executives described a lower iPhone demand for the remainder of this year, lasting "until at least early next year." 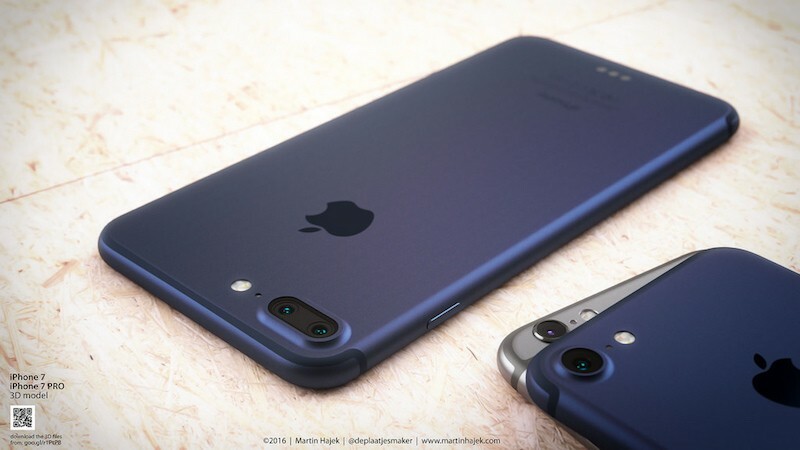 iPhone 7 Plus design mockup in "Deep Blue"
"Hon Hai Precision Industry Chairman Terry Gou has told his staff that the demand for iPhones will remain feeble until at least early next year," a source said. Hon Hai, better known as Foxconn Technology Group, declined to comment. Gou told Chinese Premier Li Keqiang in China in late May that the company's overall orders were falling this year, although Foxconn did receive a sudden rush of orders in April and May. Foxconn makes about 70% of iPhones sold globally. Whether that means the supplier would begin working on the expected mega-cycle "iPhone 8," or another mid-cycle upgrade similar to the iPhone SE, early in 2017 is unclear. Nikkei's sources opine that Apple's attempt to shake up an upgrade cycle with no notable new hardware features by introducing new colors -- seemingly referring to the recently rumored Deep Blue -- proves "that the company now has no way of breaking out of the current doldrums." Still, the 5.5-inch iPhone 7 Plus could come with a few notable new hardware revisions, namely a dual-lens camera that would allow for 2-3x optical zoom capabilities, clearer and brighter images, and the ability for users to refocus an image after taking a picture. Otherwise, the handsets are expected to remain largely in line with the iPhone 6s design, besides the potential removal of the headphone jack and redesigned set of antennae bands. If the headphone jack goes, and the dual camera is indeed limited to the Plus model, "new colors" isn't going to be anywhere near enough to tempt this longtime iPhone user to upgrade. I've pretty much made the decision to hold on to my 6 Plus for a third year after the snore fest that the next iPhone looks to be. Holding on to hope that the rumours about the 2017 redesign are true. The iPhone is starting to feel and look outdated. I even considered switching to a Galaxy S7 Edge but I'm too heavily invested in the Apple ecosystem and everything would fall apart. Also the fact I hate Samsung, Android and Google. But the S7 Edge does look pretty cool compared to the iPhone. I get that the iPhone design is iconic but they could easily put a modern twist on it. Remember when the iPhone 4 got announced and everyone went crazy because it was such a departure from what we'd seen before? We haven't had a moment like that for a while. They could even make the iconic home button digital. Introduce an edge to edge display. Just make it actually look modern! I'm a huge Apple fanboy but slowly becoming frustrated and bored. I'm starting to think that when the iPhone 7 is released the Mac Rumors Buyer's Guide entry will be updated to 'Don't Buy'. I'm focusing on the wrong thing, but that deep blue iPhone mockup sure is purdy. "The great smartphone boom is about to bust. consumers are now savvier about when and where they purchase their handsets." Apple will eventually need to let go of the year to year design consistency and start adding in innovation to the hardware and software. Start expanding its capabilities that's been capable since jailbreaks were done all the way back in 2008. Eventually, though, some of that innovation boom just levels out. But that's why apple was apple. They were able to innovate and provide something we didn't know we wanted. That seems to have gone with Jobs. Dropping sales, plus a saturated market should be an incentive for Apple to be pushing out innovative phones, rather than different colours, and the usual "thinner, faster, slimmer" line. These prognosticators are ridiculous. First of all, even if iPhone sales don't see YoY gains, the sales numbers will still be HUGE, so it's all relative. And as Apple always points out, the only thing that really should matter is that they are making, not losing, money. The iPhone, albeit a big portion of their sales and profit, is but a piece of the puzzle. I think that is why Apple is focusing on further building out the eco-system that keeps consumers engaged, whether they're buying a new iPhone every year or not. iPhones, iPads, rMBP's, rMB's, iMacs ATV and AW are all things that at some point you don't need to get new every year (given their high quality and useful life is more than 1 year). And with Apple Music creating yet another income stream and one I'm subscribed to, Apple is getting more money out of me [than they previously did], regardless of whether I'm buying a new iPhone each year. You apparently don't really know much about what you are talking about. Having huge sales numbers are great for customers to jerk over but it doesn't really benefit investors at all. Apple pays pathetic dividends so most of the value comes from growth, not profit. Huge numbers that are the same as last year nets you no return on your investment. Plus stock investment is based on predicted future value, not a score card for what you have done in the past. Apple does like to point out that making money is better, but they never actually give that money back to the owners so it's mostly lip service. I'm surprised that Apple would let rumors of an iPhone 8 get out before the iPhone 7 is even released. It's clear lots of people are waiting for a major revision. It just seems like so many people are going to skip the iterative release with all the rumors going around for 2017 model. That's going to hurt the bottom line in the near term.